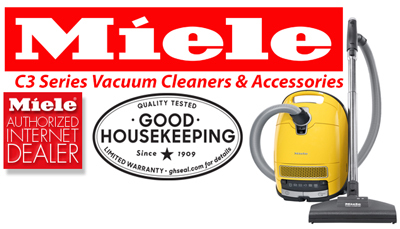 Miele vacuums have a tremendous amount of suction. So much so, you frequently have to take them off full power for many types of rugs and carpets. Especially useful for homes with cleaning help, the Miele Marin C3 Complete takes all the guesswork out of choosing the right suction for the job. Just set the vacuum to ”Auto” and forget it. As the Marin travels from bare floors to area rugs to carpet, it senses the different flooring and changes the suction to just the right amount for the surface you’re cleaning. 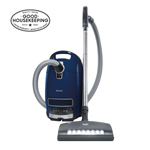 The Miele Marin vacuum comes standard with the top-of-the line SEB236 for a deluxe package suitable for all types of carpet. The SEB236 features a bright LED headlight to see under furniture, a soft rubber bumper to protect baseboards and an auto-stop parking feature that shuts off the brush when in the upright position.